Per his military service record (regimental no. 4867), John Thomas Parker was born at Warren, N.S.W. He gave his age as 28 years, his marital status as single, and his occupation as grocer. His description on his Certificate of Medical Examination was height 5 feet 10 ½ inches tall, weight 144 lbs., with a dark complexion, brown eyes, and brown hair. His religious denomination was Roman Catholic. He claimed that he had no previous military experience. He completed his medical examination on 21st October 1915 at Dubbo, and was attested at Dubbo on 21st October 1915 (along with William Henry Nicholls, who was also from Coonamble). The Dubbo Liberal and Macquarie Advocate reported that ‘Mr. Jack Parker, a Coonambleite, caught up to and joined the “Coo-ees” at Molong’. He and William Henry Nicholls were the ‘two men from Coonamble’ reported in The Gilgandra Weekly to have caught up with the Coo-ees when they were at Molong on 22nd October 1915. On 22nd November 1915 at the Liverpool Camp he was charged with being absent without leave. He was fined 1 days pay. On 7th February 1916 he was charged with being absent from special piquet. He was fined 5 shillings. On his embarkation roll his address at time of enrolment was Namoi Street, Coonamble, N.S.W. His next of kin is listed as his mother, Mrs M. [Marion] Parker, at the same address. 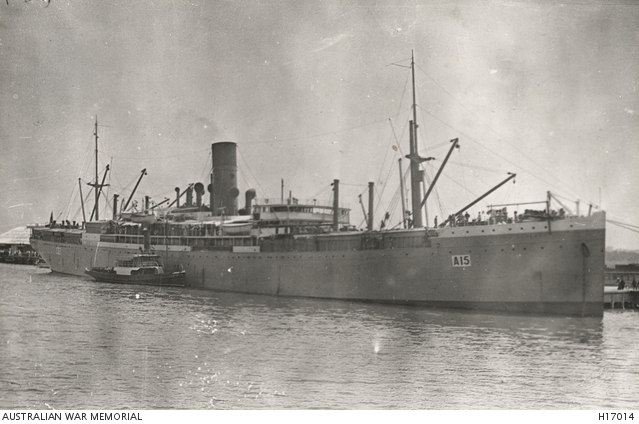 On 8th March 1916 Private Parker, along with many of the other Coo-ees, departed Sydney on the HMAT A15 Star of England with the 15th reinforcements for the 13th Battalion, and arrived in Egypt on the 11th April 1916. On 16th April 1916 Private Simpson was transferred to the 4th Pioneer Battalion at Tel-el-Kebir. On 4th June 1916 Private Parker left Alexandria aboard the Transport Scotian bound for France. He arrived at Marseilles on 11th June 1916. On 18th August 1916 the 4th Pioneer Battalion was resting and training after just coming out of conducting works around Pozieres, France, when Private Parker was charged with being absent from 1400 Parade. He was awarded 8 hours Field Punishment no. 1 and fined 1 days pay. On 19th October 1916 Private Parker was sent to the 12th Australian Field Ambulance sick with conjunctivitis. He was admitted to the 24th General Hospital at Etaples on 24th of October 1916. On 28th October 1916 he was discharged to the 4th Australian Division Base Depot at Etaples, France. On 8th of December 1916 Private Parker was charged with drunkenness and being in possession of spirits on the 6th of December 1916. He was awarded 14 days Field Punishment No. 1. On 12th December 1916 Private Parker re-joined the 4th Pioneer Battalion whilst it was conducting works and tramway maintenance in the vicinity of Longueval, France. On 15th June 1917 Private Parker was charged with being absent without leave from 2100 on 6th June 1917 till surrendering himself to the Military Police at 2115 on 8th June 1917. He was awarded 28 days Field Punishment No. 2 and fined 37 days pay. On 25th July 1917 a Field General Courts Martial was held where Private Parker was charged with whilst being on active service absenting himself without leave from 2100 on 12th July till apprehended by R.S.M. Middleton at 2030 on 13th July 1917. He was found guilty, and sentenced to 6 month imprisonment with hard labour. On 2nd August 1916 the sentence was commuted to 90 days Field Punishment No. 1 and fined 103 days pay. On 17th August 1917 Private Parker was sent to the 4th Australian Field Ambulance sick. He was transferred to the 39th General Hospital at Le Harve, France. He was discharged from hospital on 1st September 1917, and sent to the 4th Australian Division Base Depot at Le Harve, France. On 29th October 1917 Private Parker was charged with being in Le Harve town without a pass and being out of bounds on 27th October 1917. He was awarded 14 days Field Punishment No. 2 and fined 14 days pay. Private Parker re-joined the 4th Pioneer Battalion on 26th November 1917. On 28th February 1918 Private Parker was sent to the 13th Australian Field Ambulance with Pyrexia. He was transferred to the 53rd Casualty Clearing Station. On 3rd March 1918 he was moved to the 2nd Casualty Clearing Station. On 6th March 1918 he was placed aboard the 19th Ambulance Train and admitted to the 55th General Hospital at Boulogne suffering trench fever. On 13th March 1918 Private Parker was placed aboard the H.S. Cambria and transferred to England, where he was admitted to the Tankerton Military Hospital at Whitstable, England, later that day. On 5th April 1918 Private Parker was transferred to the 3rd Australian Auxiliary Hospital at Dartford, England. On 3rd May 1918 he was discharged from hospital, and sent to the No.3 Command Depot at Hurdcott, England. On 23rd June 1918 Private Parker was admitted to the Brigade Hospital at Hurdcott suffering from Influenza. He was discharged on 1st July 1918. On 6th July 1918 Private Parker was transferred to the No.1 Command Depot at Sutton Veny, England. On 14th October 1918 Private Parker marched into the Overseas Training Brigade. On 6th November 1918 he departed Southampton bound for France. He arrived on 7th November 1918, and re-joined the 4th Pioneer Battalion in France on 11th November 1918. On 10th February 1919 Private Parker departed Le Harve, France, bound for England. He arrived at Weymouth on 11th February 1919. On 13th April 1919 Private Parker departed England aboard the Transport Commonwealth bound for Australia. During this voyage he was admitted to the ship’s hospital with scabies in 25th April 1919. He was discharged on 7th May 1919. Private Parker arrived in Australia on 12th June 1919. He was discharged Termination of Period of Enlistment on 20th July 1919. Australian War Memorial. First World War Embarkation Roll, John Thomas Parker, 4867. Australian Imperial Force unit war diaries, 1914-18 War – AWM4 Subclass 14/16 – 4th Australian Pioneer Battalion, August 1916.